Do you know the #1 reason people leave their job? It's the quality of the relationship they have with their boss. This relationship is measured as employee engagement and the statistics are abysmal. We’ve created, tested, and measured a new tool for improving employee engagement—simple enough for any manager to use with any employee. 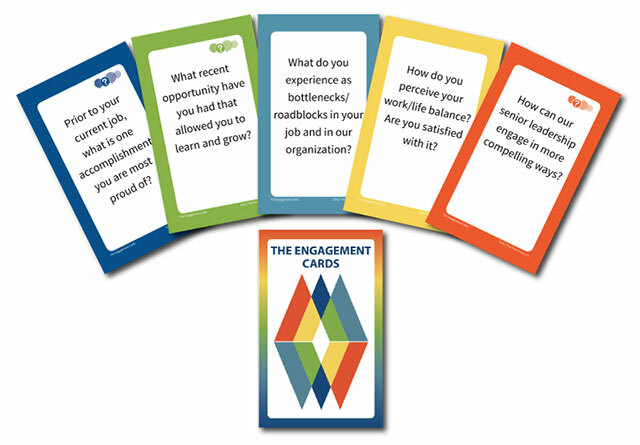 The Engagement Cards are already producing results for managers using them in one-to-one meetings and in team or other group settings. Very useful — a lot of the questions really address issues and concerns employees have, but may be nervous to ask. What are The Engagement Cards? We really like the range of questions, not just the standard ones. They were less structured and more personable and made us laugh. Using the cards helped the conversations be more relaxed. Please contact us before ordering if any international shipping is required. We offer a free 1/2 hour consulting session to help you plan your Engagement Cards rollout and optimize for success. Contact us to schedule a time. The Piras Group can deliver a complete 2 hour workshop and rollout package to help you improve your organization’s employee engagement integrating The Engagement Cards and our key learnings from the years of experience we have in this area. An easy-to-use facilitator guide helps a leader or facilitator with time, sequencing, and key points to make at each step. This workshop is turnkey and can be immediately implemented in your organization. 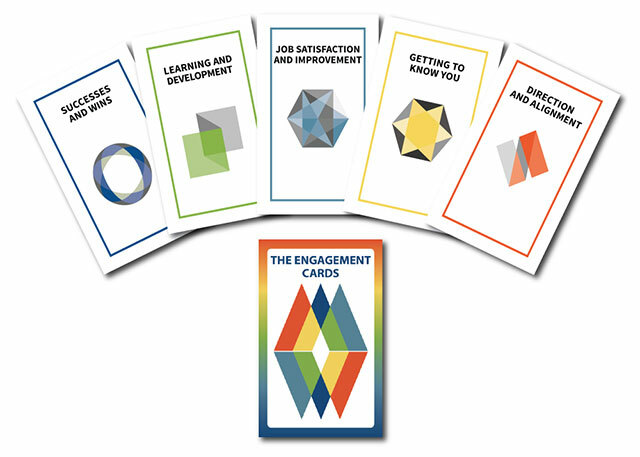 You can order as many decks of The Engagement Cards as needed for your company population. We also offer a completely customized option with your organizations colors and choice of design elements. Contact us for more information. How do The Engagement Cards work? 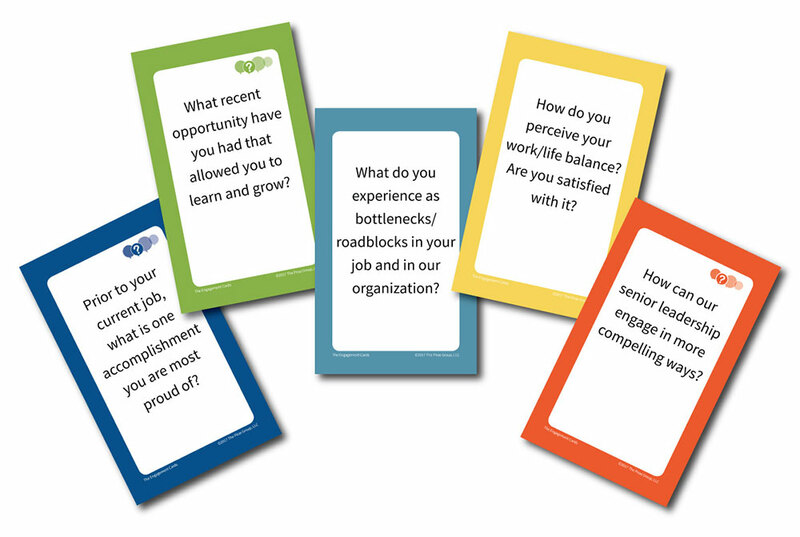 The Engagement Cards remove what sometimes feels like that “awkward factor” in manager/employee conversations and provide the manager with a tool for increasing engagement that is easy to use, practical and fun. Using the cards in a variety of settings helps to encourage a culture of openness and more authentic conversations. Each card contains a question that’s part of a larger category of questions. The categories focus on different topics of conversation that managers and employees might have together. The 5 categories are: Getting to Know You, Successes and Wins, Job Satisfaction and Improvement, Learning and Development, and Direction and Alignment. Note: Cards are chosen first by the employee, to create an atmosphere of exchange and dialogue, rather than a manager-to-employee review. Conversations are best held frequently and can range from just a few minutes to a half-hour or more. We encourage all managers to keep a deck of cards on their desk, ready for use, and to incorporate them into the agenda for existing one-on-one meetings.